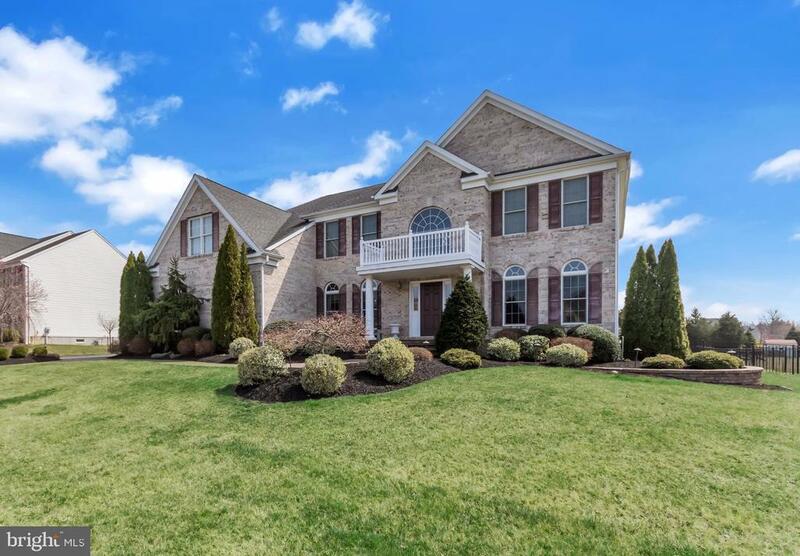 All Mullica Hill homes currently listed for sale in Mullica Hill as of 04/22/2019 are shown below. You can change the search criteria at any time by pressing the 'Change Search' button below. If you have any questions or you would like more information about any Mullica Hill homes for sale or other Mullica Hill real estate, please contact us and one of our knowledgeable Mullica Hill REALTORS® would be pleased to assist you. 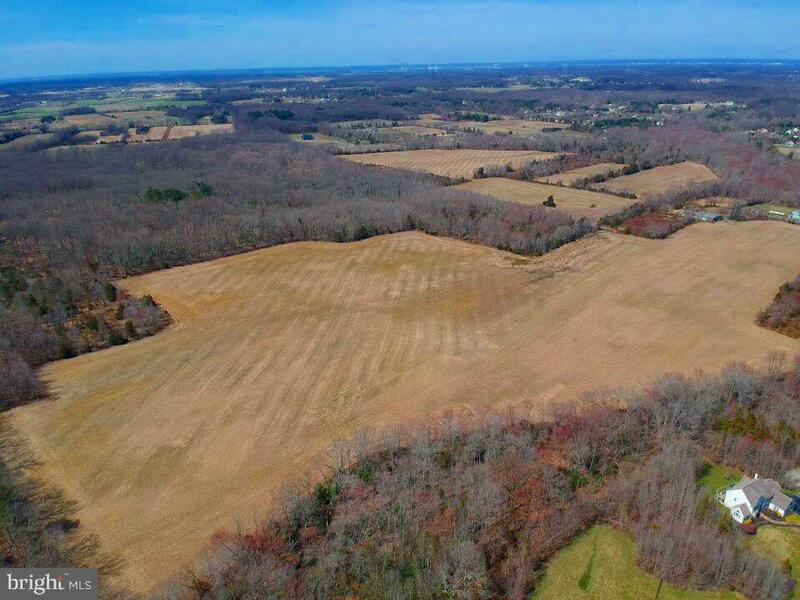 "178.48 Acres of unpreserved ground located in South Harrison. This property is stunningly large with its bucolic views of 5 separate farm fields encompassed by woods. The property features frontage from both Franklinville Rd and Commissioners Rd. The surrounding area to this property is higher end homes for prospective builders to consider. The soil type is listed by the USDA as predominately Keyport Sandy Loam, 2 to 5% slopes. For farmers, this ground is eligible to be placed into Farmland Preservation. The property is located with convenient access to the NJ Turnpike, Rt 55 and Rt 295. 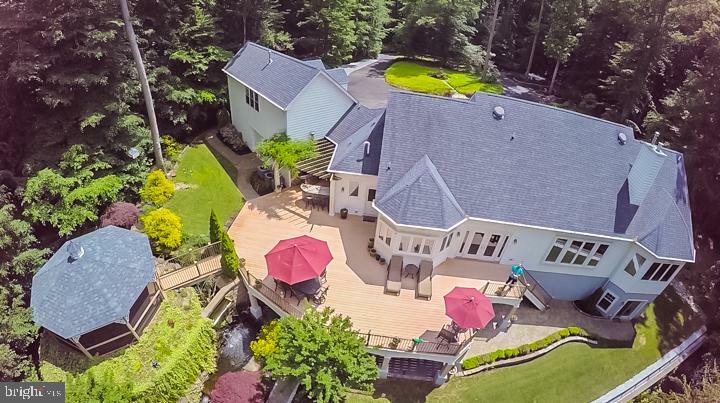 Drone videography of the property can be found here: https://youtu.be/d82hoPzeI5s"
"The STATELY appeal of this property will strike you as soon as you approach this Custom Built Home. The long and winding driveway will force you to slow down and take it all in~the expansive lawn, flowering trees and landscape~the back -drop of the woods off in the distance . THIS is what you come to South Jersey for! Land, space~a BIG view of the spectacular spring sky. Pull up to the Courtyard feel that was created by the way the 3 car garage is oriented to the house. The deep front porch spans the entire length of the home, and invites you in. Step across the threshold, and you will feel the warmth as sunshine floods this space and opens your eyes to the magnificent architectural details of the formal and informal spaces in this home. The Dining Room is framed with beautiful arches and detailed moldings, and is a perfect entertaining space that is both intimate, and expansive as necessary. Further into this home, you will be delighted that there is both DRAMA in the wall of windows and the OPEN FLOOR PLAN, and warmth. The Great Room is graced with the ~Wall of Windows~ and MANY doors leading out to your back deck and outdoor kitchen (more about that in a bit! ), and is also graced with a GORGEOUS fireplace, and custom niches~and of course a lot of beautiful woodwork that continues to delight. The classic details in the kitchen, Antique-white custom cabinetry, over-sized island with multiple levels and of course a granite that you must see to appreciate, are to be expected in a house of this stature. You will be surprised by other details, like the large Pantry, butlers area in the kitchen, again, for ease of entertaining. On the other side of the Main Floor is a Master Suite that you could NOT have imagined. High ceilings, moldings, MANY windows that allow you to enjoy the private views of the back deck and outdoor fireplace, along with wild-life:) The en-suite Master bath has custom cabinetry that allows for everything to have a space, and further allows for you "
"There is no better location in all of Mullica Hill. 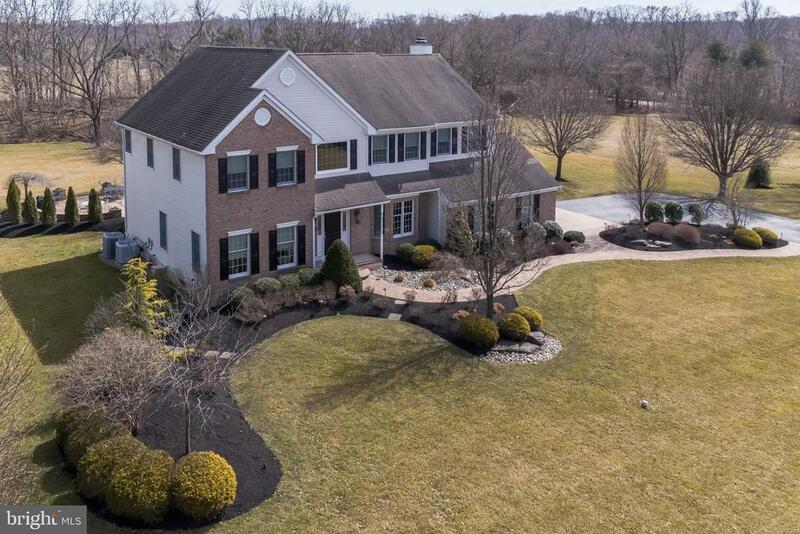 This home is perfectly situated on a private 2 acre+ cul-de-sac lot in the most prestigiously acclaimed community of Mullica Hill, THE ENCLAVE at Forest Woods. This home will not disappoint! The enormous open foyer will immediately greet you with its luxurious columns, iron balusters, exquisite BRAZILIAN CHERRY hard wood floors, and a view into your personal executive office with French doors, gorgeous coffered ceiling, custom built-ins and recessed lighting. The foyer flows seamlessly into the formal living room and dining room, elevated by the meticulous detail of the crown molding and wainscoting, and into the parlor/sitting room with built-in bar and sweeping 270-degree views of your secluded lot. The pillars continue into the family room with vaulted ceilings, gas fireplace and two-story PICTURESQUE VIEWS of the backyard, tiered Trex deck and HEATED SALTWATER SWIMMING POOL. The family room is open into the gourmet eat-in kitchen with custom cabinets, GRANITE countertops, upgraded appliances, oversized island with seating and a wet bar with wine fridge, storage and sink, and sliding-door-access to the back deck, perfect for entertaining! Upstairs and through the French doors you will find yourself in the generously-sized master suite oasis with dedicated sitting area, relaxing master bath with jetted soaking tub and dual walk-in closets. Down the hall, a junior suite, two additional bedrooms, a bonus room and a full bath round out the second floor. If that is not enough, the FULL WALKOUT DAYLIGHT BASEMENT has been completely finished to include a full bath, tiled kitchenette area, rec room and a sound-proofed recording studio. This space is ideally located just steps from the pool for ease of entertainment or could be the perfect solution for in-laws, au pair or older children. Not to be overlooked are the myriad of upgrades including three-car extended-width-side-entry garage, stamped concrete driveway and sid"
"Seller will be providing a credit of $15,000 to turn this property into a 4 bedroom (1 of 2 options for placement). 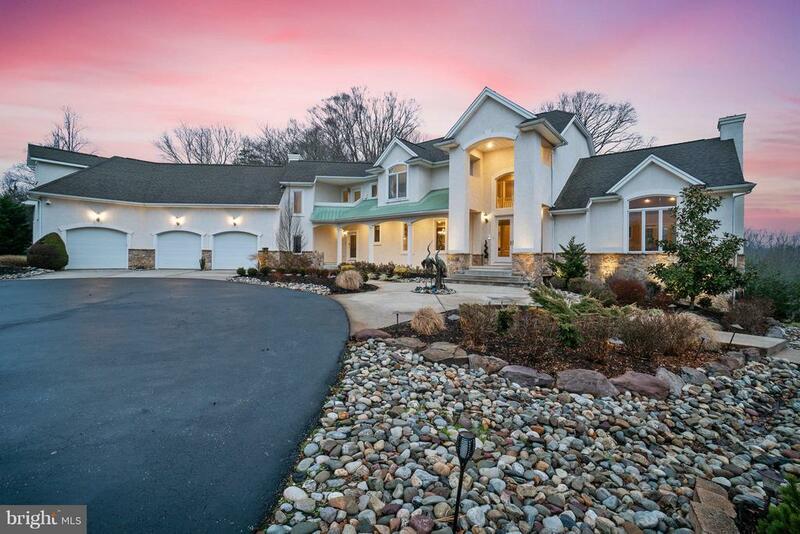 Providing ideal harmony between natural beauty, prominent architectural detail, and state of the art upgrades, here you have found your private paradise in the idyllic Mullica Hill countryside. This Illustrious Equestrian Estate Nestled on 9+ Acres of mesmerizing rolling pastures with stables is also a true ~Smart Home~, featuring scores of remote capabilities. Each of the 11 Security Cameras, Motion Sensor Detectors, and Lights (each with LED bulbs) in the home can be accessed from a smart phone or Alexa device, any time or place. The Solar Panels and Carrier GreenSpeed Air Conditioning also make this property Energy Efficient. Not a single luxury was spared in the crafting of this home, as each bedroom features an Ensuite with Jacuzzi Tub and Private Balcony Patio. From the peaceful pond, stocked with largemouth bass, blue gill, Minnows, and various other fish, to the barns and fenced pastures, serenity radiates throughout the property. Entertaining family and friends will be effortless during warmer seasons, when you can take full advantage of the incredible In Ground Pool with a slide, diving board, and Hot Tub. Enjoy the Hot Tub year round, compliments to the Power Roof, LED Lights, and Over 100 Jets. Inside this exquisite home, nothing short of magnificence awaits. Enter beneath a remarkable Chandelier into the Grand Foyer, and revel in your first introduction to the elegance that will greet you throughout. Glide into your Formal Dining Room, boasting Hardwood Floors, Elegant Molding, and tons of natural light. You will be instantly drawn toward the magnificent Great Room with Vaulted Ceilings, THREE Sets of French Doors, Hardwood Floors, Built In Cabinetry, and Stunning Skylights. As you catch notice of each delight, instantaneously begin imagining the dinner parties you will host amongst family, friends, and colleagues. Pride of ownership radia"
"Luxury meets location in this exquisite 4 bedroom, 5-1/2 bath custom built Shadowbrook Trail home on a coveted cul-de-sac. The extensive, outdoor oasis makes this the perfect staycation home! - The This home's list of amenities is impressive! The 2 story chandelier greets your arrival from the moment you enter the door. Gourmet kitchen with 42 inch cabinets, granite countertops extra-large custom island and Wolf Range. First floor executive study with fireplace. Handcrafted woodwork throughout. Master bedroom suite includes a double-sided gas fireplace a spa-like master bedroom bath complete with expansive walk in master closet which contains a central island storage unit. Whole house generator, Sunroom that overlooks the fenced in outdoor oasis with Gunite pool, hot tub. Well planned attention to detail to this homes exterior meticulous landscaping and hardscaping broadcasted over 3 acres. Absolutely excellent timing for hosting all your holiday events. Schedule your showing today." "Final Phase now open!!! Private, wooded 11.1 acre lot with walking paths and breath taking views nestled in a cul-de-sac surrounded by custom homes. Come see why Nocentino Homes is one of the finest custom home builders in our area. Where meticulous attention to detail and fine quality craftsmanship stand out in every home. We make building a home exciting and easy. Start by choosing one of our floor plans and if you want to make changes, no problem. From small changes to designing your own home, that's our specialty. There is nothing Builders Grade in a Nocentino Home. Some of our quality features are 9FT ceilings and 8FT estate height doors, rounded drywall corners, open floor plans, perfectly designed archways and stately columns. Make your home a showpiece with our outstanding windsor trim designs and our handcrafted staircases. Visit our design centers and a professional will help you design every facet of your new home. Making choices has never been easier! Design your dream Kitchen, Choose your cabinets, center island layout, granite, hardwood flooring and light fixtures. Dreaming of that free standing tub in your master bathroom? Nothing is impossible! All floor plans include 2x6 exterior walls, 3 Car Garage, 2 Zoned HVAC, Full Basements with 9FT Superior Wall System. Price does not include the lot premium that applies to this lot. Home To Be Built. Other floor plans available. Photos are of finished homes to show the builders work. Agents must register their buyer in person prior to first visit in order to receive a commission." "Only once in a life time can you seize a special property such as this. Just driving down the tree lined driveway to your own sanctuary is so lovely. This property was painstakingly carved out of a very special piece of nature's paradise that took years in the making. Your private paradise awaits you... nested On The Knoll among century old oaks and flowering mountain laurels with breathtaking views of a waterfall and Raccoon creek. This gorgeous custom design features an easy 1 story open concept floor plan. Bring on the chef in this grand gourmet kitchen that features custom cabinetry with roll outs, granite floors and counter tops, custom back splash with granite inlaid and stainless appliances. The great room is most impressive with soaring ceilings and expansive views of this incredible home site that's complimented with warm Bruce maple hardwoods, a granite fireplace with floating shelves and accent lighting! No expense was spared in this entertainers dream home with expansive decking, a built in outdoor kitchen bar, and relaxing gazebo so you can sit among all that nature has to offer! The owners en-suite includes the panoramic property views, walk in closets and lavish private porcelain tile bath, jacuzzi with inline heater and multi head shower! Additional bedrooms are spacious and the 4th bedroom is currently used as an office. The FULL walk out finished lower level ( 1500 sq. ft.) is FABULOUS with a Manhattan style built in bar with refrigerator, wine frig. quartz counter and flat screen TV's. Of course there is a large home gym and still plenty of storage room in the lower level, walk out slider to a covered custom paver patio. The spacious laundry room includes cabinets too! The 3 car garage features Moto flooring and an additional back garage door for your convenience. The BONUS room above the garage is vaulted (648 sq. ft.)and includes a half bath AND a separate entrance - perfect for office, craft, in-law or young-adult suite! There are numerou"
"STUNNING, EXECUTIVE, ESTATE HOME IN THE BEAUTIFUL community of the ENCLAVE in HISTORIC MULLICA HILL. This meticulously kept gem is graced with custom detail, timeless elegance and stately upgrades throughout. Enter a stunning foyer with soaring ceilings, gracefully appointed staircase and grand chandelier. Great room with vaulted ceilings, transom windows, custom trim and molding package, plantation shutters and anchored by a lovely marble hearth. The GOURMET EAT-IN kitchen offers 42 custom wood cabinets with built-in organizational details, STAINLESS STEEL APPLIANCES, DOUBLE OVENS, island with seating and wine storage, GRANITE COUNTERTOPS, stone backsplash with custom accents. The luxurious owners'suite, with tray ceiling, recessed lighting and spacious sitting/library/dressing room offers versatility and custom walk-in closet. The EN-SUITE bath boasts two dressing and vanity areas, upgraded bath fixtures and oversized stall shower with seating. The full WALK OUT BASEMENT offers additional space and is ready to be finished to the new owners' style The conservatory, perfect for any occasion, boasts cathedral ceilings and wall to wall windows. Enjoy the beautiful view of the property on the loggia...amazing area to relax and entertain! Taxes have been appealed & reduced. Enjoy historic downtown Mullica Hill ... just minutes away with plenty of restaurants and shopping! Mullica Hill is also close to additional shopping and restaurants, major commuting routes, parks and recreation, Delaware TAX-free shopping, and Philadelphia." "CUSTOM HOMES to be built in The Crossroads at Mullica. Beautiful 1 to 11 acre wooded and tree lined lots with Custom homes ranging from the Mid 500's to 2 Million. Come see why Nocentino Homes one of the finest CUSTOM home builders in our area. Where meticulous attention to detail and fine quality craftsmanship stand out in every home. We make building a home exciting and easy. Start by choosing one of our floor plans and if you want to make changes, no problem. From small changes to designing your own home, that's our specialty. This Jacobson model is perfect for customizing a master down or in-law suite. There is nothing Builders Grade in a Nocentino Home. Some of our quality features are 9FT ceilings and 8FT estate height doors on the 1ST Floor. Rounded drywall corners, open floor plans. Perfectly designed archways and stately columns. Outstanding windsor trim designs and handcrafted oak staircases. Visit our design centers and a professional will help you choose every facet of your new home. Our kitchen designers will assist you in designing your dream gourmet kitchen. Choose your cabinets, where you want your appliances, the center island layout, style granite, hardwood flooring and light fixtures. 3 Car Garage, 2 Zoned HVAC, Full Basement, 9 FT Superior Walls, steel beam construction. Home To Be Built. Lot premiums may apply. Photos are of finished homes to show builders work. Agents must register their buyer in person prior to first visit in order to receive a commission." "Custom Homes Built Exactly The Way You Want! The Crossroads at Mullica, Executive Style Homes Nestled in Private Wooded Lots in the most sought after town of Mullica Hill. Come see why Nocentino Homes one of the finest custom home builders in our area. Where meticulous attention to detail and fine quality craftsmanship stand out in every home. We make building a home exciting and easy. Start by choosing one of our floor plans and if you want to make changes, no problem. From small changes to designing your own home, that's our specialty. There is nothing Builders Grade in a Nocentino Home. Some of our quality features are 9FT ceilings and 8FT estate height doors, rounded drywall corners, open floor plans, perfectly designed archways and stately columns. Make your home a showpiece with our outstanding windsor trim designs and our handcrafted staircases. Visit our design centers and a professional will help you design every facet of your new home. Making choices has never been easier! Design your dream Kitchen, Choose your cabinets, center island layout, granite, hardwood flooring and light fixtures. Dreaming of that free standing tub in your master bathroom? Nothing is impossible! All floor plans include 2x6 exterior walls, 3 Car Garage, 2 Zoned HVAC, Full Basements with 9FT Superior Wall System. Lot premiums may apply. Home To Be Built. Photos are of finished homes to show the builders work. Agents must register their buyer in person prior to first visit in order to receive a commission." "CUSTOM HOMES to be built. The Crossroads at Mullica. Beautiful 1 to 11 acre wooded lots with Custom homes ranging from the Mid 500's to 2 Million. Come see why Nocentino Homes one of the finest CUSTOM home builders in our area. Where meticulous attention to detail and fine quality craftsmanship stand out in every home. We make building a home exciting and easy. Start by choosing one of our floor plans and if you want to make changes, no problem. From small changes to designing your own home, that's our specialty. There is nothing Builders Grade in a Nocentino Home. Some of our quality features are 9FT ceilings and 8FT estate height doors on the 1ST Floor. Rounded drywall corners, open floor plans. Perfectly designed archways and stately columns. Outstanding windsor trim designs and handcrafted oak staircases. Visit our design centers and a professional will help you choose every facet of your new home. Our kitchen designers will assist you in designing your dream gourmet kitchen. Choose your cabinets, where you want your appliances, the center island layout, style granite, hardwood flooring and light fixtures. 3 Car Garage, 2 Zoned HVAC, Full Basement, 9 FT Superior Walls, steel beam construction. Home To Be Built. Lot premiums may apply. Photos are of finished homes to show builders work. Agents must register their buyer in person prior to first visit in order to receive a commission." "New Construction Beautiful 1.25 acre lot in The Crossroads at Mullica, located in the most sought after town of Mullica Hill. Come see why Nocentino Homes one of the finest custom home builders in our area. Where meticulous attention to detail and fine quality craftsmanship stand out in every home. We make building a home exciting and easy. Start by choosing one of our floor plans and if you want to make changes, no problem. From small changes to designing your own home, that's our specialty. There is nothing Builders Grade in a Nocentino Home. Some of our quality features are 9FT ceilings and 8FT estate height doors on the 1ST Floor. Rounded drywall corners, open floor plans, perfectly designed archways and stately columns. Make your home a showpiece with our outstanding windsor trim designs and handcrafted oak staircases. Visit our design centers and a professional will help you choose every facet of your new home. Our kitchen designers will assist you in designing your Dream Gourmet Kitchen. Choose your cabinets, center island layout, granite, hardwood flooring and light fixtures. All floor plans include 2x6 exterior walls, 3 Car Garage, 2 Zoned HVAC, Full Basement 9FT Superior Wall System. Lot premiums may apply. Home To Be Built. Photos are of finished homes to show the builders work. Agents must register their buyer in person prior to first visit in order to receive a commission." "The Estates at Devonshire's Yorkshire Estate Elevation Model Home is now for sale. This impressive builder's model home boasts over 4,600 finished square feet including a fully finished basement with recreation room, media room, 5th bedroom and full bath. Home also was built with a 3 car side entry garage. Walk in to a 2 story open foyer with a turned staircase. Formal living room and dining room. Fabulous gourmet kitchen with granite countertops, 9 ft. oversized island, stainless appliances, hardwood flooring, 42 inch upgraded cabinets, eat-in breakfast nook and expanded sunroom off the back of the kitchen. The family room includes a 2 story stone fireplace and a rear staircase. Master bedroom suite with a sitting room and 2 large walk-in closets. Master bath includes a 5 ft. walk-in sports shower and 2 separate comfort height vanities. The 2nd level also includes 3 additional bedrooms and a Jack N' Jill bathroom and Princess bath in bedroom #4. Off the rear of the home, it also has a 12x14 Trek deck and an abundance of additional landscaping and fully sodded yard with irrigation system. HOME WILL BE READY FOR OCCUPANCY IN APRIL 2019! Better HURRY only 5 homes remain before the Estates at Devonshire is 100% sold out!" "New Construction to be built in The Crossroads at Mullica located in the most sought after town of Mullica Hill. The Lysette Grand is offered on this gorgeous 1.05 lot backing to open space. This stunning open floor plan features radius floating staircase with juliet balcony. Grand 2-story family room with hardwood flooring, circle-top wall of windows, gas fireplace with raised hearth slate surround & recessed lighting. Gourmet kitchen with porcelain tile flooring, 42 raised panel cabinets, crown molding, granite counter tops, double deep bowl sink, center island, soft touch drawers, vented range hood, elegant corner glass cabinet, recessed lighting & 2 large pantry areas. Butler's pantry with 42 cabinets and granite counter top. Rear staircase with oak treads and white risers. Mud Room/Laundry Room includes free standing laundry tub & porcelain tile flooring. Retreat to the Owner's Suite w/step ceiling, DOUBLE walk-in closets, sitting room and huge dressing room. Relax in your corner tub and enjoy the oversized tiled shower with soothing rain forest showerhead. Double sink and vanity area with granite counter tops. Princess Suite features full bath with porcelain tile flooring, vanity with granite counter top. 3rd & 4th Bedroom Share Jack & Jill Bath. 9FT Walk-up basement with sliding glass doors. 2 zone high efficiency HVAC, 3 car garage. Convenient to Shopping, Major Highways and LOCATED JUST MILES FROM THE NEW INSPIRA MEDICAL CENTER"
"First time on the market for this absolutely stunning beauty with attention to every detail. The home has over 6000 square feet of living space with many custom features including main floor hardwood floors, wood trim, crown molding, wine/butler pantry, main floor laundry/mudroom, tile flooring in kitchen with center island and granite counter tops and French doors that lead to a gourmet grilling station with tap frig and multi tiered granite counter/bar. Entertain on the large composite deck over looking a large beautiful yard and wooded area and play set. Walk-out finished basement complete with full bathroom. Front and back staircase leading to the second floor, 2 master suites complete with walk in closets and jet tubs. One of the master suites also has its own sitting room complete with doors for added privacy and 2 separate walk in closets. The upstairs hallway is so large there is another sitting area outside the second master suite. No detail left untouched. The home offers privacy and at the same tome offer easy access to shopping, restaurants, entertainment and major highways and bridges." 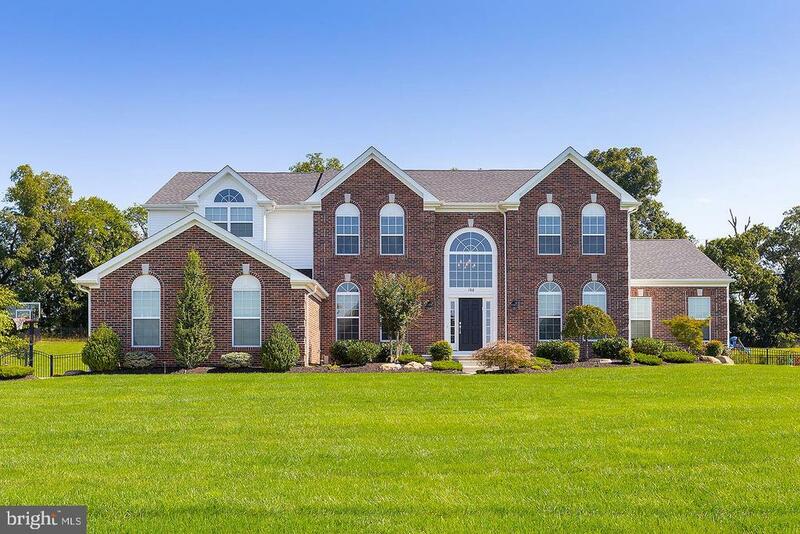 "Located in the desirable Woodland Creek neighborhood of Mullica Hill is where you will find this stately brick home. This stunning property rests on an clear acre lot and boasts one of the most pristine paver patio backyards and in-ground pools in the area. The two story foyer greets you with gleaming Brazilian hardwood floors that flow throughout most of the first floor, as well as an upgraded hardwood staircase with wrought iron spindles. To right is the open and bright living room, to the left is the detailed dining room complete with shadow boxing wall trim, crown molding, and thick baseboards. The kitchen is a cooks dream with a large 9+ft. center island, walk-in pantry, plentiful cabinet space, stainless steel appliances, large polished porcelain tile flooring, built-in wine fridge and a spacious breakfast room lined with windows. Relax in the upgraded family room with the two-story gas fireplace and additional bump out. Work from home in your private and spacious office, also located on the first floor. The second floor offers a luxurious master suite, featuring a massive walk-in closet which was converted from the original sitting area, a second walk-in closet, and a private master bathroom with a double vanity, large soaking tub, and tile shower. Then there are three more detailed bedrooms furnished with chair rails and shadowing boxing, as well as a full bathroom with a tile shower to complete the second floor. The large finished basement is fitted with a custom bar, a gym, a large play/flex room, as well as another media room/office. The backyard is an absolute entertainers paradise, leaving no details spared. From the large paver patio, paver walk-way and oasis, outdoor kitchen/bar, electric hook-ups, newer shed, saltwater gunite pool and hot tub all lined with Tennessee stone. Put this one at the top of your list, it won't last long! *Property is dual-zone temperature controlled with one of the A/C units being less than 3 years old. Home is also equippe"
"Magnificent Executive Estate home in a highly sought after private Tom Paparone Enclave in Mullica Hill. The stately curb appeal as you drive up will whet your appetite for what is to come. First thing you will notice is the professional landscaping and oversized driveway...perfect to fit more of your toys! And yes there is a 3 car garage to tuck away that convertible. As you enter in to the voluminous center hall you will immediately be drawn to the gorgeous sweeping staircase...and then you will be delighted to find hardwoods underfoot, and that they continue through much of the main floor. To your right is the Dining Room which is dramatic in that it is not a square conventional space, but rather a dynamic room with niches, TONS of natural sunlight spilling in though all those windows, and a more flowing space perfect for your lavish dinners. The large formal living room is there too, a bit more tucked away, yet a space that allows for REAL use! The office is immediately to your left as you walk in, so private enough to take care of business when necessary, but also facing the front of the house so you can feel a part of the outdoors. Head towards the back of the house and it will be hard to decide your favorite feature! The wall of windows popular in these Executive homes will not disappoint in your Great Room, complete with fireplace and bar area...and this all opens into the GORGEOUS kitchen with GRANITE and stainless steel of course, tumbled marble backsplash, and one of the largest center islands you will find! Add to this the sunroom just off this space and you will be thrilled!! The second floor Master Suite is just what you have imagined with a sitting room, see through fire place, and huge walk in closet. The Master Bathroom is equipped with his and her vanities and a soaker tub overlooking the gorgeous backyard. The open and bright hallway upstairs with second set of stairs is more drama that you have been craving. The bedrooms are BIG, so all can"
"New Construction Beautiful 2.80 acre wooded lot in The Crossroads at Mullica, located in the most sought after town of Mullica Hill. Come see why Nocentino Homes is one of the finest custom home builders in our area. Where meticulous attention to detail and fine quality craftsmanship stand out in every home. We make building a home exciting and easy. Start by choosing one of our floor plans and if you want to make changes, no problem. From small changes to designing your own home, that's our specialty. There is nothing Builders Grade in a Nocentino Home. Some of our quality features are 9FT ceilings and 8FT estate height doors on the 1ST Floor. Rounded drywall corners, open floor plans, perfectly designed archways and stately columns. Make your home a showpiece with our outstanding windsor trim designs and handcrafted oak staircases. Visit our design centers and a professional will help you choose every facet of your new home. Our kitchen designers will assist you in designing your Dream Gourmet Kitchen. Choose your cabinets, center island layout, granite, hardwood flooring and light fixtures. All floor plans include 2x6 exterior walls, 3 Car Garage, 2 Zoned HVAC, Full Basement 9FT Superior Wall System. Lot premiums may apply. Home To Be Built. Photos are of finished homes to show the builders work. Agents must register their buyer in person prior to first visit in order to receive a commission." "Welcome to the Manors at Saratoga-an exclusive Enclave of 46 very special homes! Looking for that WOW factor- Stop your search! This spectacular home has it all! Gorgeous inside & out- Grand entry w/columns, EP Henry Paver walkways & steps, Stucco facade & oversized leaded glass doors, 3 car side turned garage w/opener on a lushly maintained & manicured 1.19 acre lot, enter the 2 story grand foyer with circular stairway. Private home office w/double doors, oval Living Rm, open Dining Rm, Expanded Family Rm w/30' ceilings, FP & recessed light & rear stairway. The Kitchen is the heart of this home w/abundant soft close wooden cabinetry, a huge center island & granite counter tops, first floor laundry & Powder Rm, beautiful open floor plan & glossy hardwood floors throughout. Full finished Basement adds another 2000 feet of living space to the homes generous 4041 sq. footage. Fabulous Game Rm w/Plasma tv & stand w/Fireplace, granite topped bar complete with RF and Barstools, full Bathroom w/shower, French doors to Billiard Rm, neutral color palette, recessed lights. 2nd floor is graced by a sumptuous Master BR suite highlighted with a tray ceiling, and a Full bath,with soaking tub, double sinks & stall shower, Walk-in closet & sitting room & shiny hardwood floors, Princess Suite boasts a private En-suite Bath, Bedrooms 3&4 share a Jack-n-Jill Bath, gorgeous Hardwood floors sparkle in the hallway, there's a custom grey stone paver covered patio off the Kitchen, sprinkler system w/ 14 zones keeps the grass lush & green. Other notables-wainscoating, neutral color tones throughout this beautiful home, 2 zoned heat & air, 50 gal. Hot water heater, decorator niches to highlight special possessions, crown molding, butler's pantry in Family room with Wine RF, exterior speakers, mature landscaping and shrubbery with dramatic landscape uplighting and more!! You will be proud to call this very special house HOME (There is a storm drainage easement in the back corner of the lot"
"Quick Delivery Home! New Custom Home By JAR Construction. Stunning Custom Home on a 1.36 acre lot located in The Crossroads at Mullica. 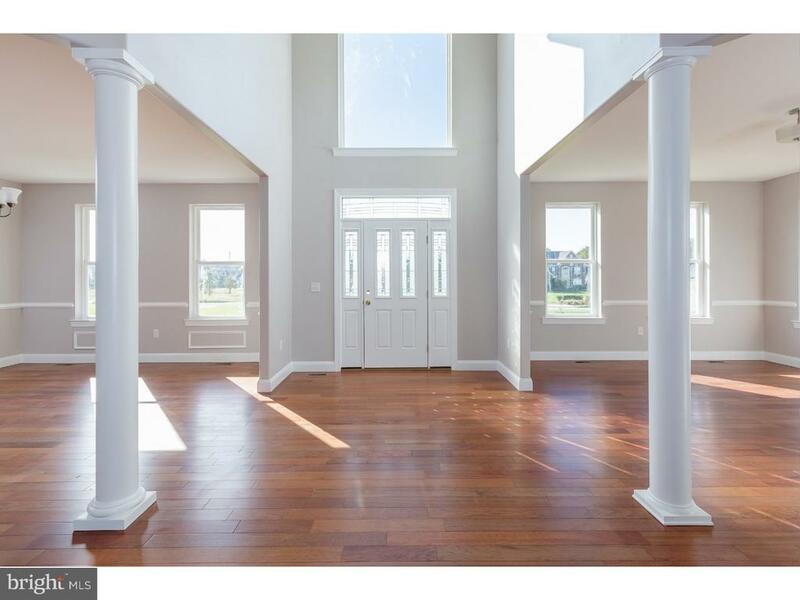 Inviting grand 2-Story foyer, living room and dining room with dramatic columns & brazilian hardwood flooring. Breathtaking circular center staircase with built-in niche and custom trim design. Gourmet kitchen with center island, porcelain tile flooring, granite counter tops, large pantry area and tiled backsplash. 2-story open great room w/gas fireplace & brazilian hardwood flooring. Double door entrance to the office also with brazilian hardwood flooring. Mud Room w/laundry tub and door to exterior. Owners Suite features a 31x14 main room, 2 walk-in closets and a luxury bathroom to include a tiled walk-in rain shower with glass doors, separate custom vanity areas and a beautiful free standing tub. Full Basement, Stucco with stone water table front, Siding on Rear and sides of home. Taxes to be assessed." "Custom Designed Oxford Elite (Georgian Elevation) by Award Winning builder Bruce Paparone under 5 years old. Meticulous attention to every detail and pride of ownership show throughout this executive home. Nestled on a picturesque court among 16 homes located in The Bluff's at Cambridge. The home boasts distinctive curb appeal and classic elegance with full brick front on a 1 acre professionally landscaped home site. The front entrance is captivating & inviting with a stunning two story foyer, SOLID OAK STAIRCASE with runner and custom trim. The formal living room and dining room both feature beautiful trim, SOLID HARDWOOD floors and arched windows with custom window treatments. The home features a MAIN FLOOR private IN-LAW SUITE including wet bar, separate full bathroom, walk in closet and laundry. The suite is versatile and can be used to fit any of your needs. The floor plan also includes a separate main floor study, powder room and large laundry room with convenient service door. The spacious GOURMET Kitchen includes a large Breakfast Nook, over sized center island, granite, upgraded stainless steel appliances with double wall oven, 36 gas on glass cook top, SS Vent Hood, SS French Refrigerator, custom back splash, butler's pantry, & food pantry with custom organization. If you love to entertain outside, the Kitchen connects to a custom 20 x 20 maintenance free SCREENED in PORCH that features a volume ceiling and outdoor patio built by the Burpee Group. The back yard is private with a tree lined rear yard. The gathering room is breathtaking with vaulted ceiling, gas fireplace with custom trim, SOLID hardwood floors, and view of upstairs bridge which overlooks onto the gathering room. The REAR STAIRCASE is conveniently located in the kitchen for easy access to the 2nd floor, laundry room & 3 car garage. The 2nd floor features an expansive Owner's Retreat with Sitting Room, solid hardwood floors, & two closets with custom organizers. The elegant en suite"
"Executive living, Luxury, Traditional & Exciting Design and Decor, and an endless attention to detail and work to create timeless elegance in this quite special residence. Quality and Thoughtfulness is present throughout. The welcoming and impressive 2-Story foyer is the perfect place to welcome family and guests alike. You'll create many fine memories in the formal and generously sized formal living & dining rooms. Notice all the refined moldings and the perfect color pallet throughout this fine home. Once you hit the gourmet kitchen you will feel at home! Perfectly designed and meticulously appointed; from the selection of custom wood cabinetry, granite counter tops, Wolf ovens, and range, Sub Zero custom built in refrigerator, Miele Nespresso Coffee Station, to the warming drawer and refrigerated drawer, you'll find this kitchen the absolute perfect spot to entertain or enjoy preparing your most favorite meals. You will be amazed at the fine details, finishes and color scheme. A complete classic! Off this gourmet kitchen you'll find the most welcoming & comfortable Sun Room. Stop and notice once again all the painstaking attention to details. Insulated windows with transoms, custom window treatments, wood trimmed volume ceiling, ceramic tile flooring make a most enjoyable environment for family enjoyment or quiet time. The first floor is completed with a stylish powder room, first floor den/office, a most wonderful family room boasting a cozy gas/log fireplace, skylights, cathedral ceilings, and wonderful finishes. Enjoy a conveniently located laundry room off the side entry 2-car garage. Outside you'll enjoy a most picturesque setting. Pristine views, immaculately maintained grounds, custom hardscaping alongside gorgeous plant material and country setting all compliment this wonderful home. The owners also invested in an oversized custom shed that will accommodate tools and much storage. Take time to walk around these grounds and you'll appreci"
"Come and get your own piece of PARADISE! This exquisite home is absolutely incredible in EVERY detail! Please do not miss this rare offering in this upscale community. Brick and Stucco front set the appeal along with impressive upscale designer features such as warm mahogany flooring, custom moldings, paints, draperies, lighting fixtures and so much more! The family room features a dramatic floor to ceiling custom stone fireplace. The gourmet kitchen features granite counter tops, tile backsplash, large pantry and wine rack. The owners retreat is every homeowners dream featuring a FABULOUS custom closet, one especially for your SHOES! An amazing custom bath that features HEATED travertine tile flooring, beautiful large tiled shower with oil rubbed fixtures and multiple shower heads!A second bedroom pricncess suitewith it's own bath is a great addition to the second floor also. The FULL walk-out basement is just as lovely with custom archways,and a true MEDIA room which includes seating! 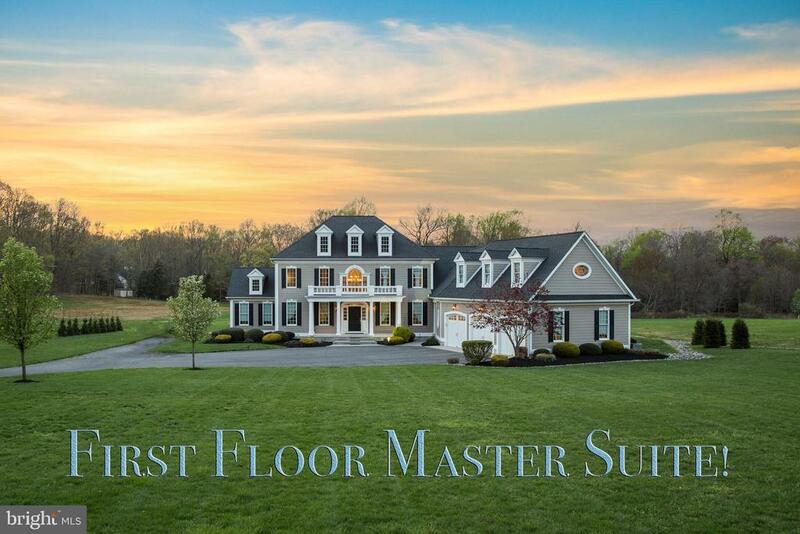 GORGEOUS private setting, in-ground pool, hot tub, tiered trex deck...It's a PERFECT 10!Listing Office"
"Welcome to one of the most luxurious developments in Mullica Hill. Youwon't be disappointed when you enter the elegantly appointed foyer that istailored with beautiful decor. You will be astounded at the open floor planand large rooms. The Living and Dining rooms will warm your heart and giveyou a rich traditional feeling. You will admire the beauty and quality of thisCustom Kitchen. If you love to cook and entertain, than look no further. Youhave more than enough counter space with a huge island, vegetable sink, 2Jenn Air oven's and a 6 burner Jenn Air cook top with grill and down draft.Slip into the family room where you can cozy up on the couch next to yourwood fireplace while listening to music with your built in stereo. The Libraryis breathtaking. It has bold lacquered built in book shelves and a gorgeousview for the writer or dreamer. The Master bedroom boasts a large sittingarea and a 10 x 15 custom walk in closest with organizers. The Master Bathis 12 x 14 with his and hers vanities and sinks. Don~t forget the Jacuzzi Tuband Stand Up shower. The 2nd bedroom is large with neutral colors. Whenyou open the closet you'll be pleasantly surprised to find an additional 7 x 5hidden walk in closet. This bedroom also has a full bath for that princess orprince. The 3 rd and 4 th bedrooms are both large with neutral colors. The 4thbedroom also has mega closet space. In addition to the regular closet youwill be amazed when you open the door to find a closet that is 32 x 7. Thisadditional closet comes with a built in desk.~This home sits on more than an acreof ground with a 3 tier deck.~ The walkout basement is 1,899 sq ft and is just waiting foryou to add a theater and a bar or whatever else you have ever dreamed of.~ This homehas so much space for everyone.~ 3 car garage with a work bench and both sides havebuilt in shelves.~ All of this located in the heart of everything. Close to shopping, minutesfrom Philadelphia and to all major highways in the Tri State area.~Make "